Legacy Stoneworks can supply our stonework jobs or other jobs with granite stone from our sister company The Hillburn Granite Company. All of our granite stone is sourced in New York State and is ASTM C615 tested as a granite dimension stone. Our granite products come in raw form such as blocks or in refined veneers and fabricated pieces for architectural stonework. We supply our stone to fabricators, homeowners, builders and other stonework contractors. 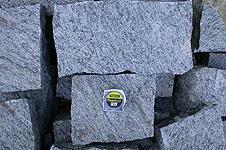 Legacy supplies raw blocks of granite for the manufacturing of value-added stone products and saw cut material. 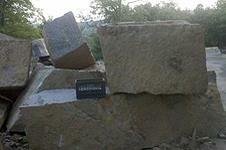 We stock granite blocks for fabricators and granite boulders for landscape purposes. Our building stone and veneer can be used for residential or commercial applications. 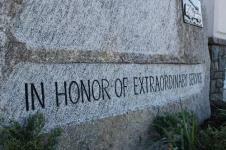 We specialize in the quarrying and supply of Hillburn Granite (TM) which is a Hudson Valley Gray Granite. The stone is cut by hand to defined thickness and for straights and corners. In addition to standard veneer stone we also produce thin veneer. Along with our veneers we fabricate lintols, arches, custom stone surrounds for windows, garages and doors as well as fireplace mantles, steps, pavers, wall coping and pier caps. Our Hillburn Gray Granite varies in color (hues of blue, green and pink) grain and texture and creates a truly natural look for your project. The beauty of Legacy's Hillburn Hudson Valley Granite is unparalleled. We work with builders, architects and homeowners to create truly beautiful and best in class fabricated, dimensional stone. From pier caps and wall coping to other forms for dimensional stone we can do it all. Our pier caps are perfect for piers at a driveway or gateway entrance or for the tops of an existing or new wall structure to compliment wall coping. 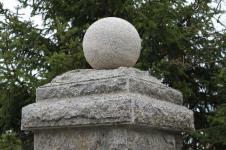 They add a regal and finished look to any existing uncapped stone structure. We can make any custom finish from thermaled to rock-faced to bush-hammered and more. We work with architectural plans or we can create custom designed pier caps. We produce hand crafted stone accessories for landscape design, interior design, garden accents and more. 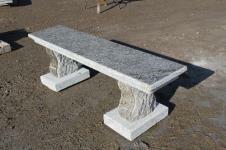 These include stone sculptures, benches, fountains and other stand alone stone products. Our stone accessories can be designed by you, your designer or by our staff. Monuments pay tribute to a cause or a group of people and preserve in memory and time forever the remembrances of events and those people who have gone before us. Legacy Stoneworks prides itself in creating unique, custom designed monuments for individuals, families, institutions and municipalities.